AREAS: http://daniel.staver.no/var/photo/storage/images/home/gallery/nature/black_forest/1765-1-eng-GB/black_forest_large.jpg Sun usually shines dull through the clouds, tree's are always intertwined in an eeire mess. 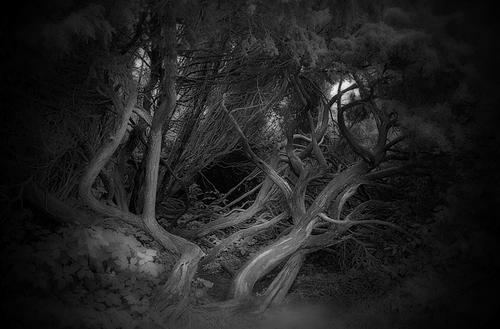 http://daniel.staver.no/var/photo/storage/images/home/gallery/nature/black_forest/1765-1-eng-GB/black_forest_large.jpg Many paths lead through the dark forest where othing mut burnt looking tree's live with nothing but silence as birds are scarece. Nothing but hares deer, elks and other canines roam here. http://daniel.staver.no/var/photo/storage/images/home/gallery/nature/black_forest/1765-1-eng-GB/black_forest_large.jpg Rumored to be the way we all entered this world arriving on the empty tracks that have been said to be where the train of souls leaved us before continuing its journey. SLAYERS: These group set out to do good by doing bad, wiping out everything unjust inthis world like guardian angels that try to wipe out the evil, these canines are granted with wings and delevered into this world of own free will to banish the evil and punish them for their bad deeds. OUTCASTS: This group of caniens are free, The have roamed this strange world and have been treated with as much respect as fleas. To suvive all these canines are granted is a single ability, simple though it may be it is effective against these killers. Some outcasts are left her of wrong justice framed for a crime they did not commit. 2. Don't go into too much detail with gore/ otherwise..
3. This will probably fail but enjoy it while it lasts. 4. Violence and romance encouraged. 5. Plot twists are allowed. History: She was framed at a murder scene and was sentenced to a second chance in the hellish wasteland. History: He may had some kind of amnesia that made him forget everything. He only remember the word "Rendianami" echoing in his head, but he is not certain if that's his real name. Other: He's blind, but can "sense the soul". He also uses a red scarf to cover his eyes. It's written in the scarf in black 622B4. Personality: Remenae is a generally kind wolf. She isn't kind when you first meet her; however. Will RP rest out. History: She was framed for killing a wolf that killed her mate, who probably wasn't caught. Personality: Mean, sarcastic, has a sweet spot(Girls, if you were wondering. Cute girls. ), will RP rest out. Crypt: It was dusk, At least i thought so, it was hard to tell the time of day in this retched place but night, it got darker almost to hard to see the prey that scurries through the undergrowth. The only thing that broke the silence was the sound of my own breath as I sat in the damp, dripping mausolem. The stench or blood and rotting flesh filled the cold tomb as if the dead themselves were all around you, It was common to feel like you were being watched once you entered the tomb though its dark interior remained empty of life unless My fellow Grave diggers or I occupied it. Currently only I sat in the empty space, my eyes sealed shut and my ears pinned back in concentration as I only slowed my breathing. I would wait until someone reported in before I'd see if there were new outcasts to the land....Those Filthy creatures didn't deserve second chance, they were to be completley destroyed and removed from this land before they bring more pain and suffering to this sad place, no good could come from thos outcasts. My dark fur was barley visible in the dim light, thankfully the Almighty one didn't bring fleas or mosquitos to this place or it would be twice the torture. Seconds turned into minutes but i could no longer wait eagerly in the darkness, I had to see where others were. Standing i dug my paws into the soft dirt beneath me, still fresh and fertile as ever, years of death brings years of life to the soil. Taking a few steps outside i looked up at the sky, nothing but a dreary gray as usual nothing changed except the faces you saw, Same food, Same tree's, Same everything. I kept my eye out for those Slayers saying they do good by leaving the outcasts be, I myself do not belive so, it is them who bring us to hatred and murder, we only do so to please our lord. I drew in a breath taking in the scents around me, seemed his fellow others were closer than he'd have expected and a world of familiar scent filled his nostrils. I smelled the air, in search of something to eat and concentrated my paws and ears on the ground. There was nothing around, not even underground. It's a shame that I couldn't see... What was everything around me? There was light? I never felt something warm on my pelt. They say that light brings warm on your face, but I only felt cold in this strange place. I walked more, ignoring something that entered in my paw and started hearing something... Someone or something was breathing. It was... A bit far. I placed my ear on the ground and started hearing vibrations. Yes... There was someone near. They were, at least, two hundred metres far. If it were enemies, I couldn't tell. This strange world is making me more and more confuse, and my blind eyes doesn't help. Even though I never saw, I can feel the other people, even if they are slowly walking next to me, I can still hear their heart beating and their "auras". I'm not so sure what auras are, I just... Know it. I removed the red scarf from my head and slowly opened my visionless eyes and "looked" around. I quickly shielded my eyes with the scarf again. Whatever that place was, it was full of dirt and it wasn't good for my eyes. I continued to follow the smell of another wolf nearby... Perhaps he or she could tell me what was this place.